Durga Puja is an important festival of eastern India. It marks the victory of good over evil. 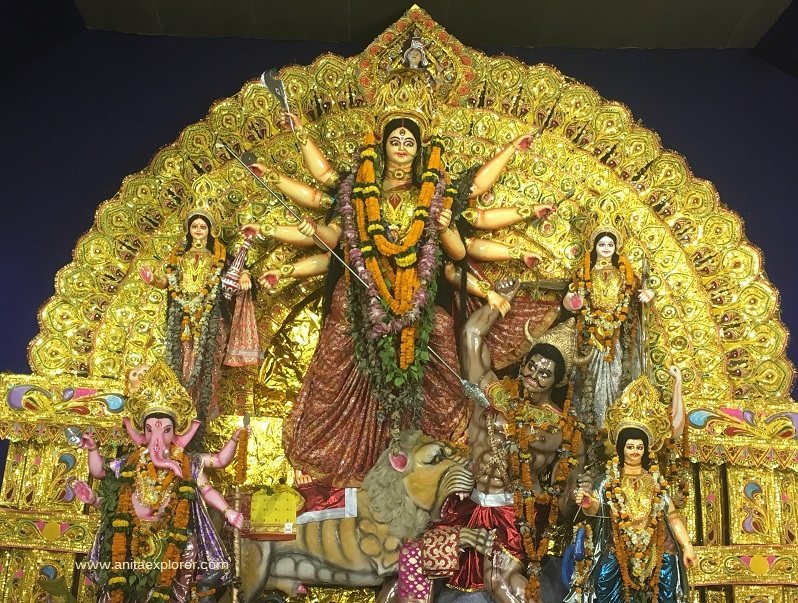 Goddess Durga is Maa Durga i.e. Mother Durga. 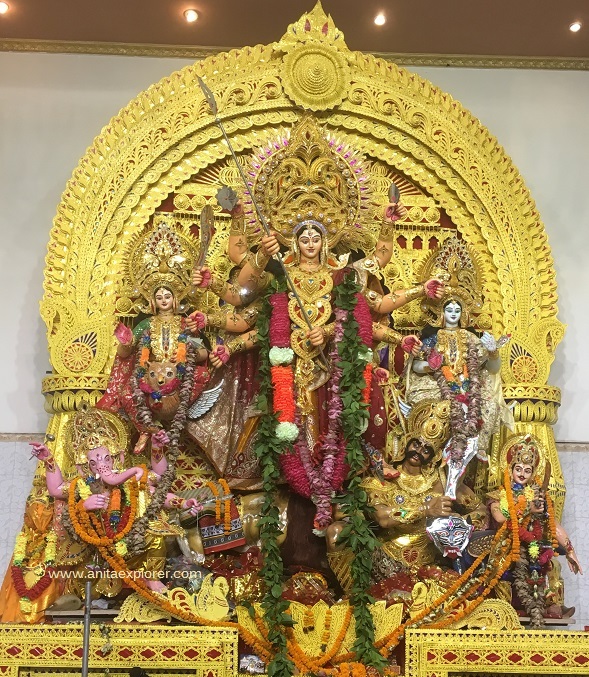 She had the powers to vanquish the evil demon named Mahishasura. Durga Puja and Dussehra is celebrated with much fanfare and excitement at Odisha, India. 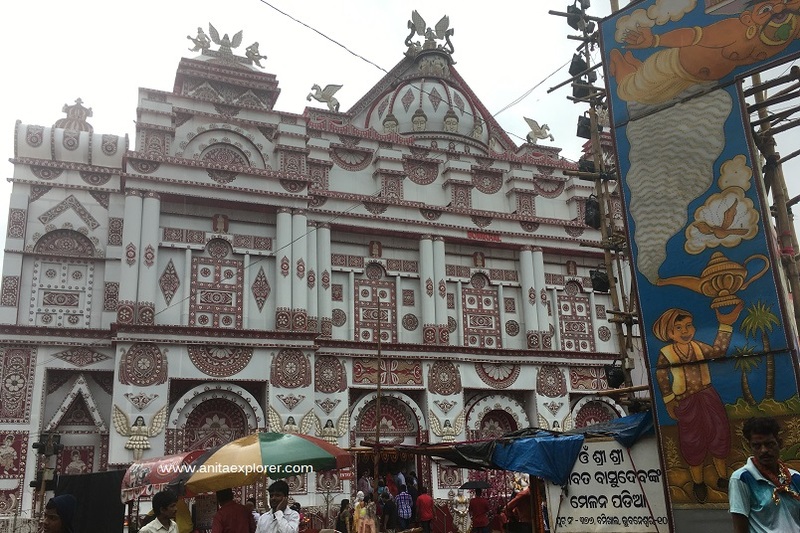 Capital city, Bhubaneswar, and its twin-city and former capital, Cuttack, have hundreds of Durga Puja Pandals. 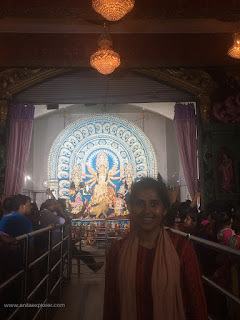 This Puja, I could manage to visit only half a dozen Pandals out of the hundreds! 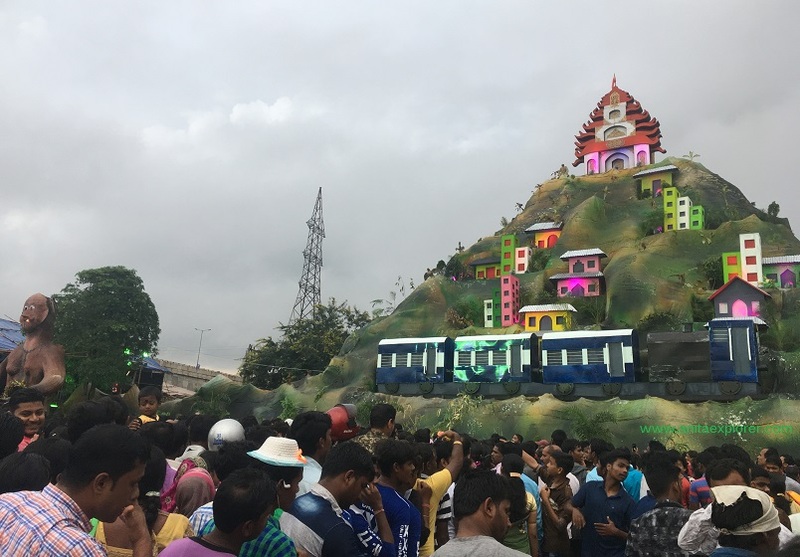 Though it was raining heavily, the rains couldn't dampen the festive spirit. 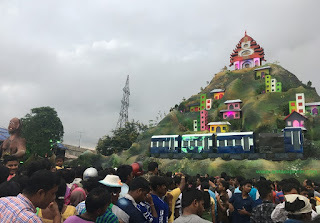 As the public flocked happily, the Pandals were teeming with ardent devotees. Parking is a nightmare. 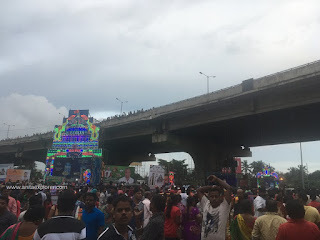 But, Pandal-hopping is so much fun! 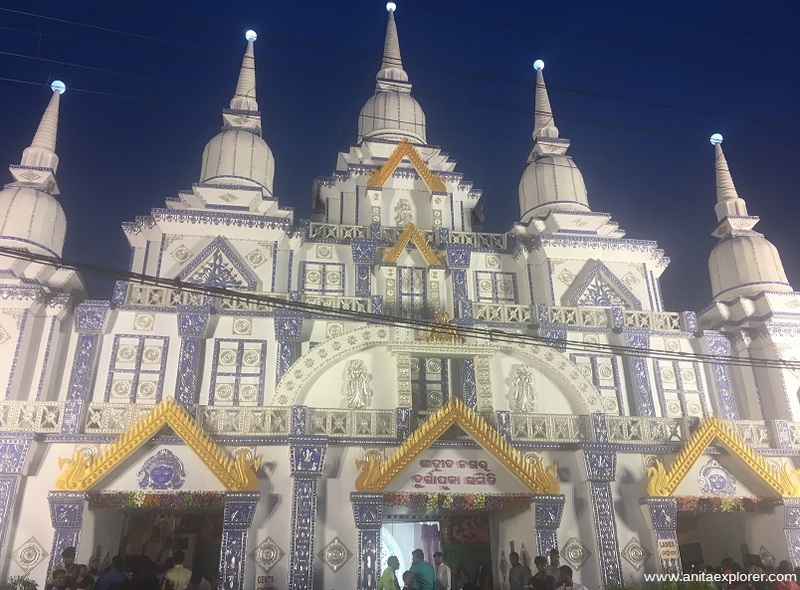 The Bomikhal Pandal was like a white palace with angels on its walls beckoning us. 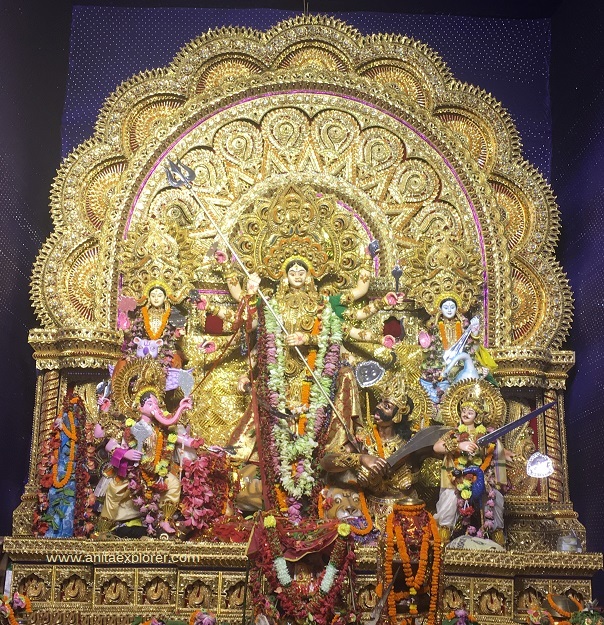 Maa Durga and her team looked resplendent in gold. 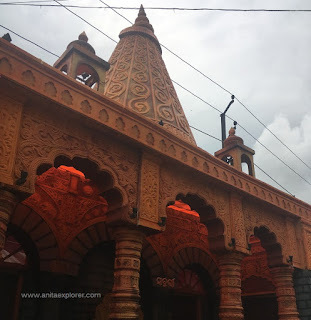 After we had visited the Pandal, and I was driving past, I requested my daughter to click some pictures from her window-seat. Notice the story of Aladin and his magic lamp and Genie on the right hand side of the following photograph. 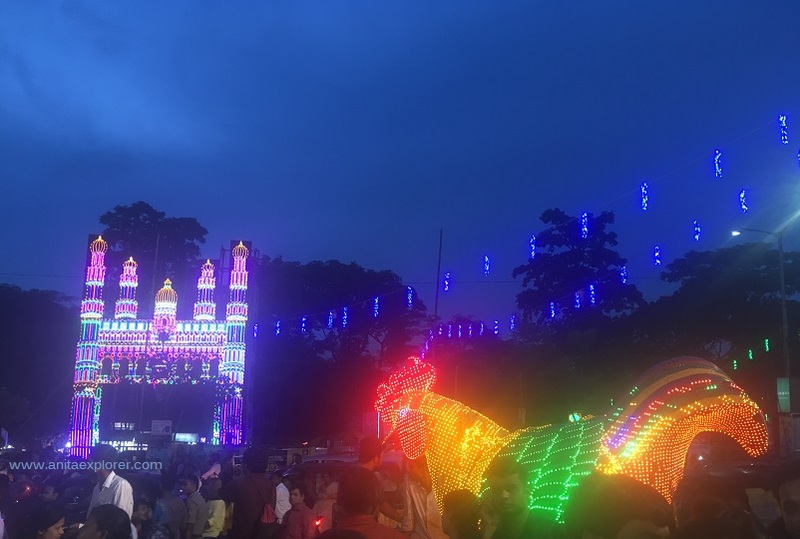 Light decorations depict many such popular stories. 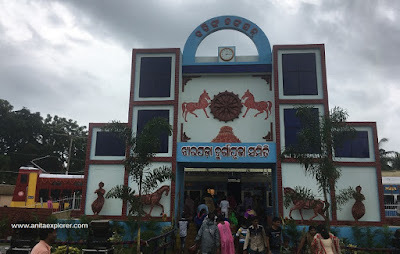 The Jharpada Pandal was smartly designed as a Railway Station! 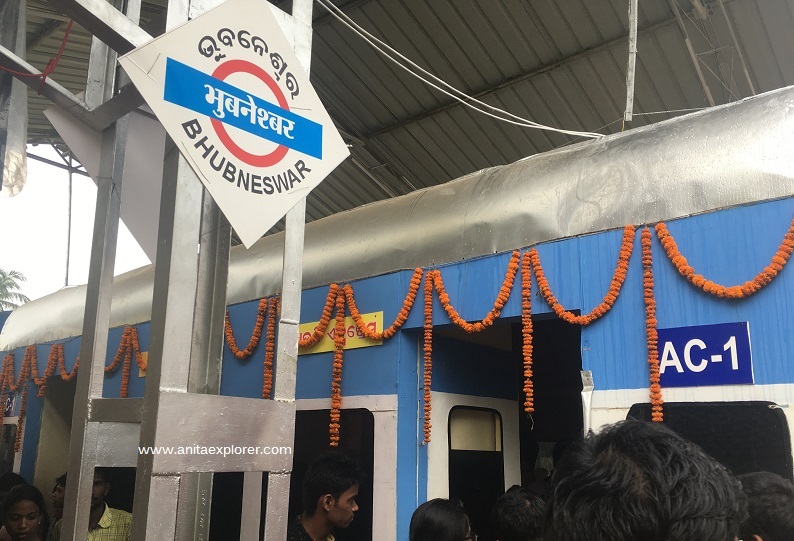 Can you imagine a brand new train decorated with fresh marigold flowers at Bhubaneswar platform? 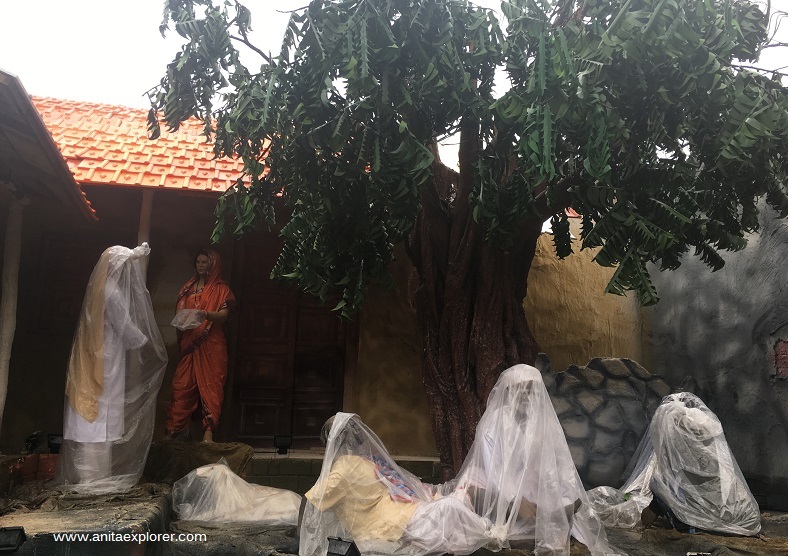 Had you been transported blindfolded to this place, you would have been mistaken for sure! 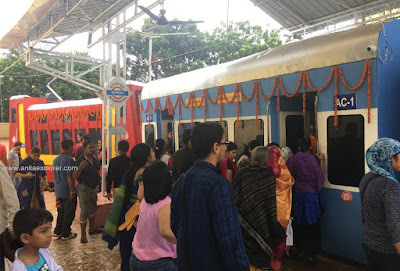 Passengers had to board the train, walk through, and then disembark at the other side to reach Maa Durga. I couldn't help but think that this is a spiritual journey made easy with modern technology. 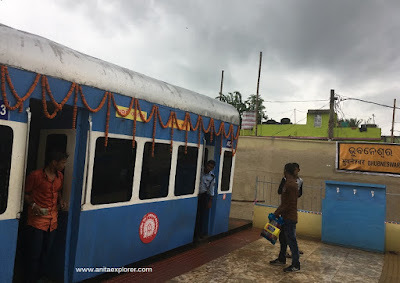 Imagine catching a train to reach the destination of the Goddess! So, who wants tickets to travel on this divine train? This darshan was free of course! 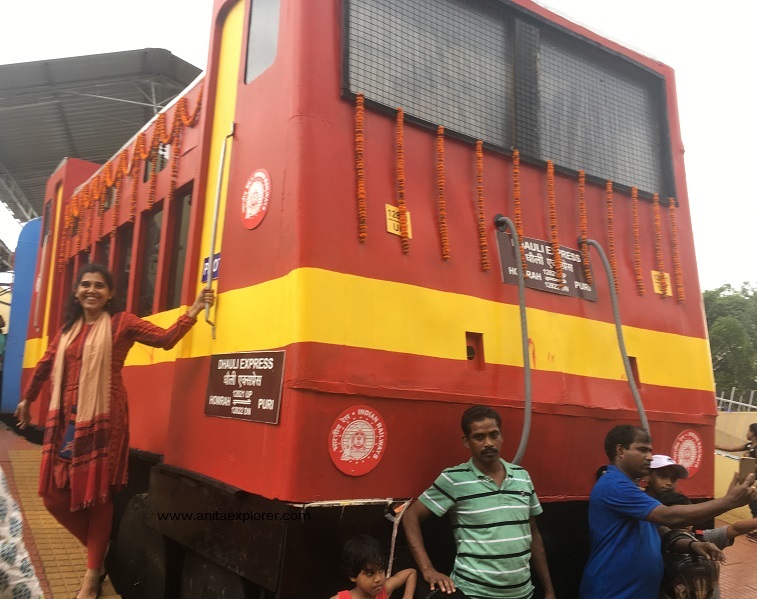 Note- This train didn't move at all! In the above pic, notice the art on the wall- Starting from left to right- Shri Jagannath Temple Puri, Door arc of the Mukteswar Temple Bhubanewar and the Sun Temple, Konark. 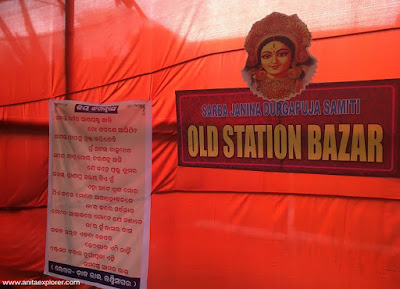 The Old Station Bazaar presented many themes. The entrance had Shirdi Sai Baba, his temple and devotees. His life-stories had been depicted. 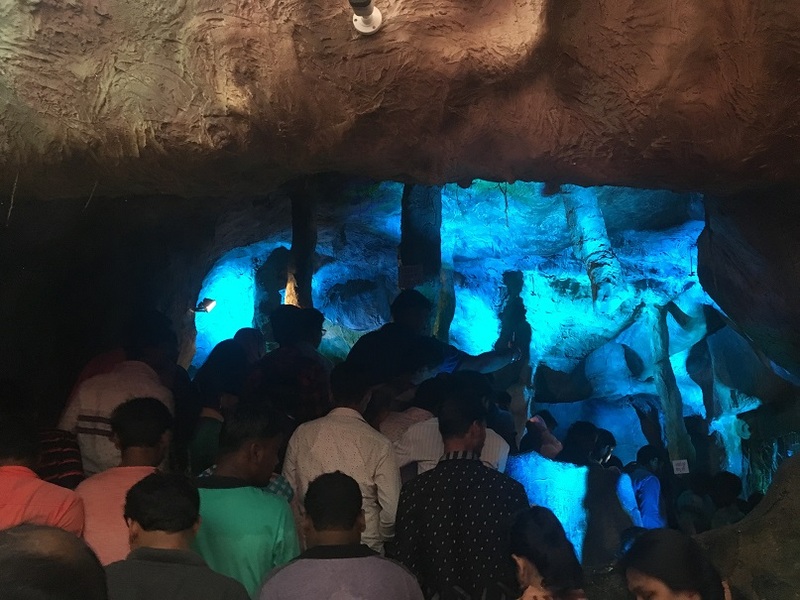 The Pandal was designed like a cave. It was dark and very crowded. 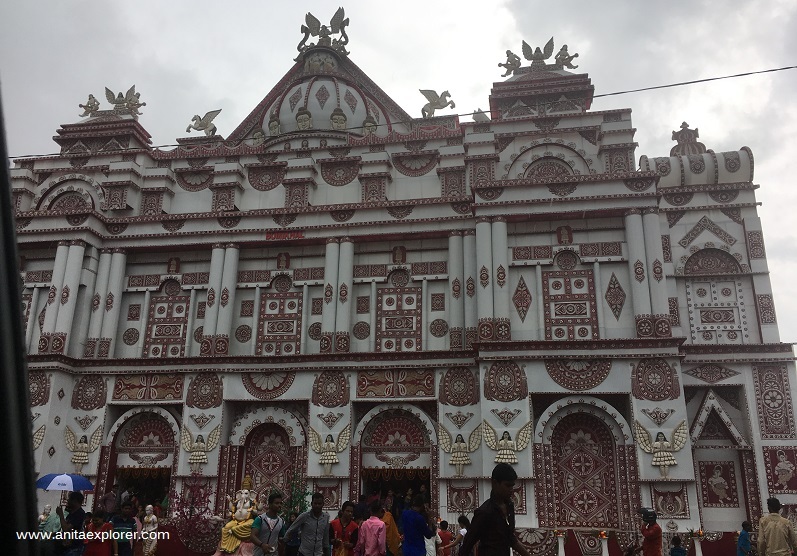 But, the visit was worth it as Maa Durga looked gorgeous in Silver. The interior of the cave was decorated nicely and many stories had been featured. 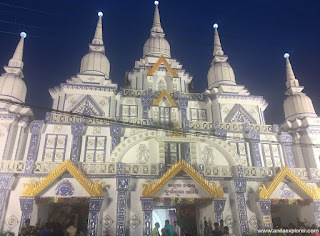 The Ashok Nagar Pandal was in the style of a palace too with elaborate decorations on the walls. 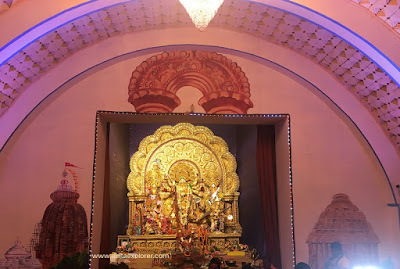 The golden background dazzled and presented Maa Durga in Her finery. The Rasulgarh Pandal presented a pretty picture of a hill with houses and a blue train. 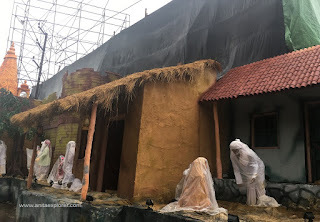 Seeing the crowd and the serpentine queues, we didn't dare to venture inside the Pandal! Notice the crowd on the flyover too! 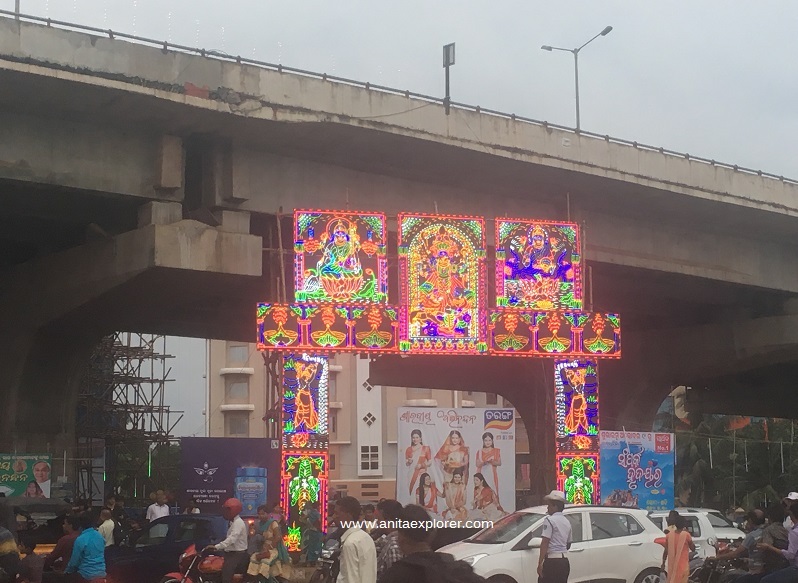 We got to see some pretty light decorations on the roads leading to the Pandal. 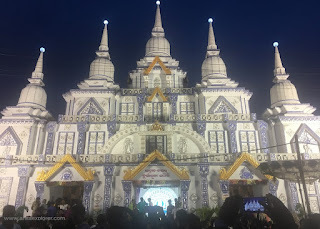 The Sahid Nagar Pandal reminded me of a grandfairy-tale palace. Attractive light decorations overlooked it from across the road. 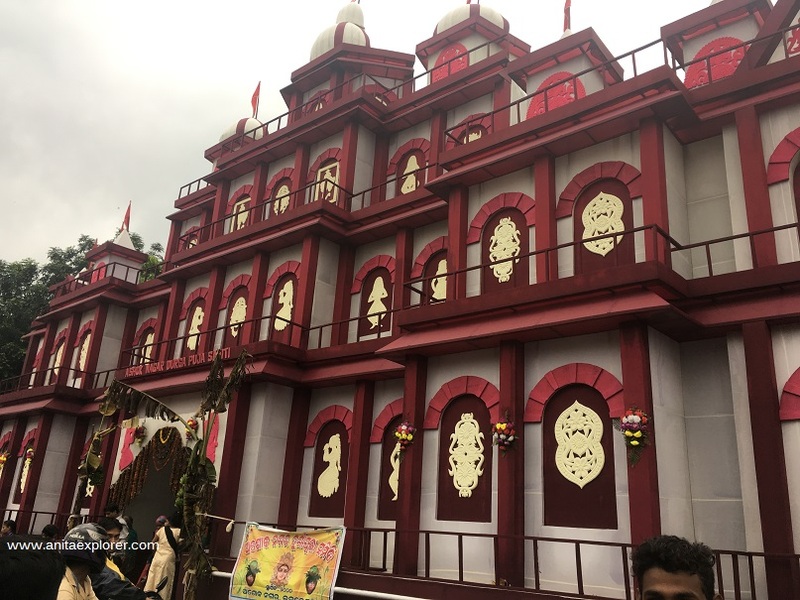 The Pandal had separate entrances for men and women. 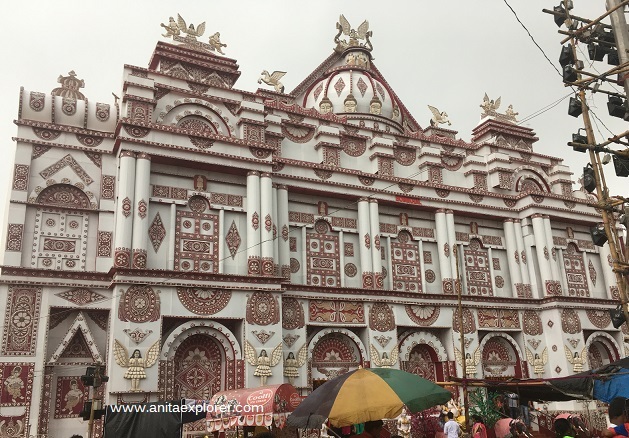 Maa Durga and Her team wore real Silver filigree ornaments and there were intricate Silver designs by skilled artisans. I loved the VIP Pass thanks to my father that gave us access to the Goddess directly without any crowd or queues. 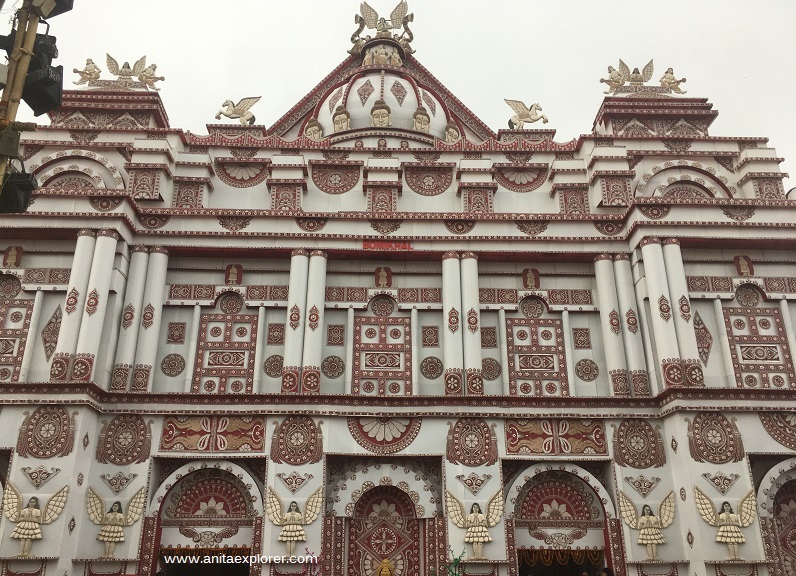 This year, I could manage to visit only half a dozen Durga Puja Pandals in Bhubaneswar. 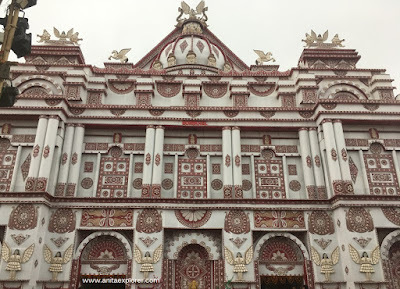 Looking forward to Maa Durga's homecoming again and to have a better Pandal-visit score next year! 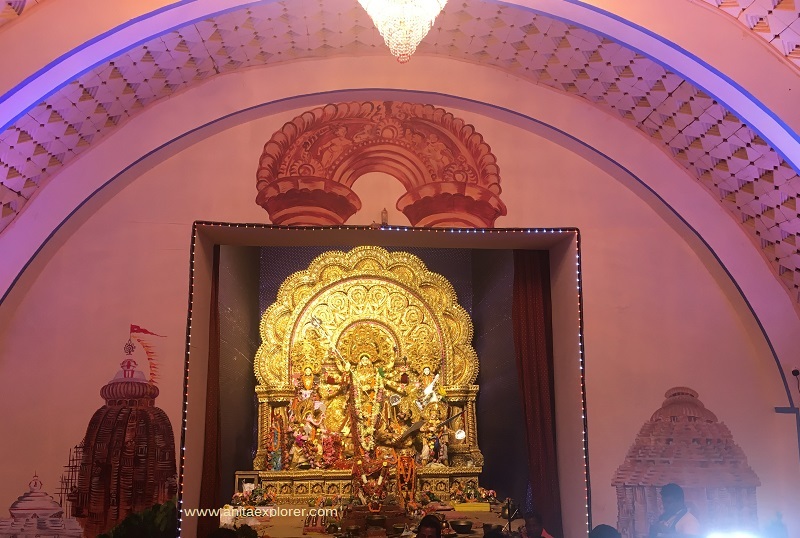 How did you celebrate Durga Puja? 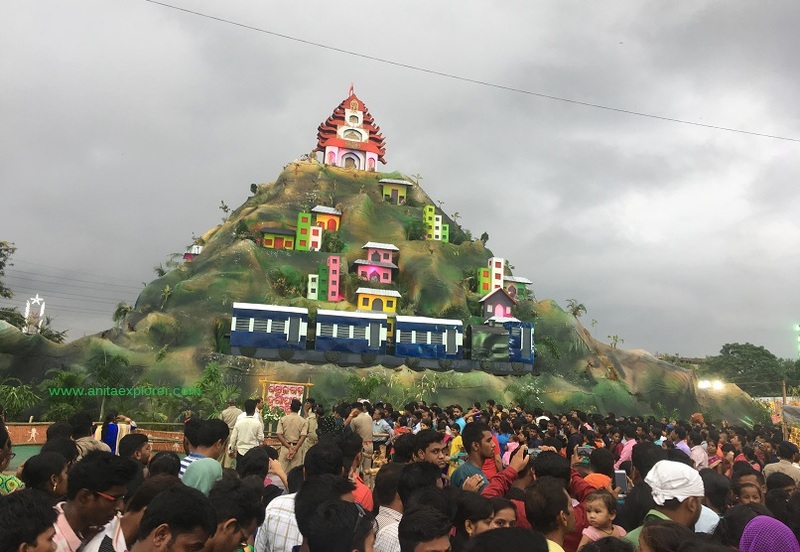 Which Pandal did you like best? Do share in the comments below. 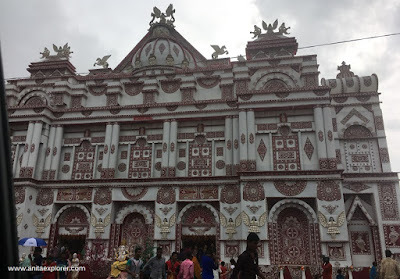 You can check out my Durga Puja Posts HERE. 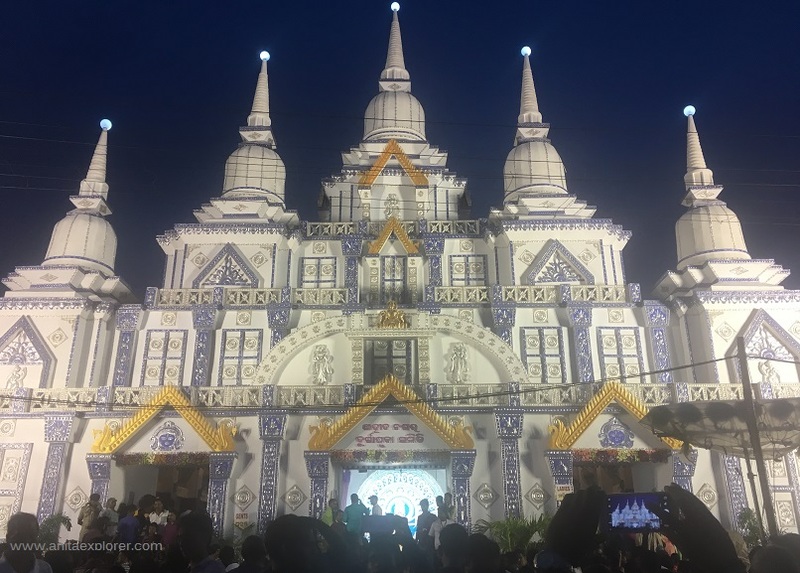 magnificient pics of the dieties and the Bomikhal pandal! Nice to see all those in your blog. Awesome creations! 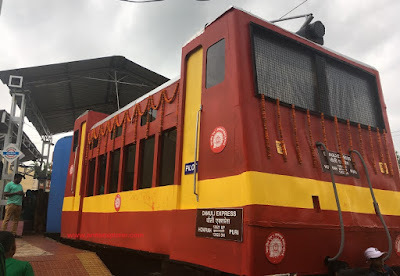 The train idea is so unique! yes!! really exciting festival. Nice post. Loved to read, Awesome pics. 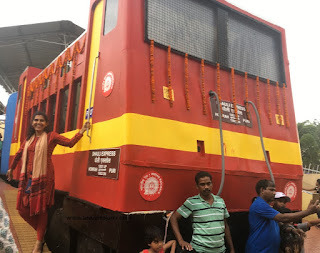 Jai Mata Di ! I could not get a chance to visit so beautiful creations of the people of Odisha or in Bengal . 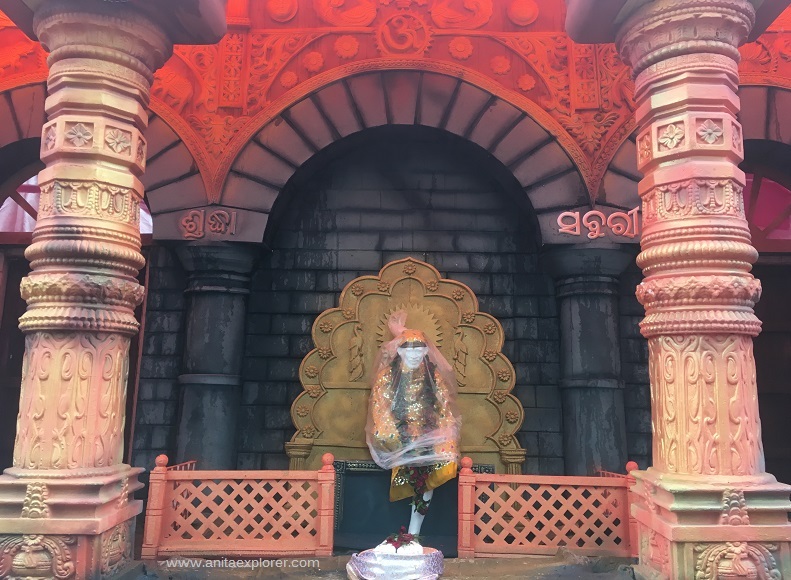 Nice compilations of the Bhubaneswar Pandals. 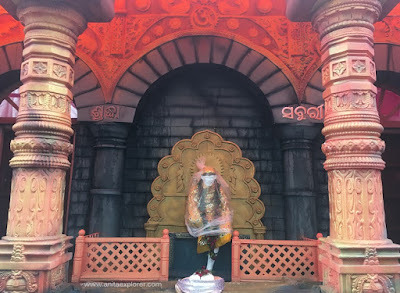 Missing the flavours of the Odisha puja season. 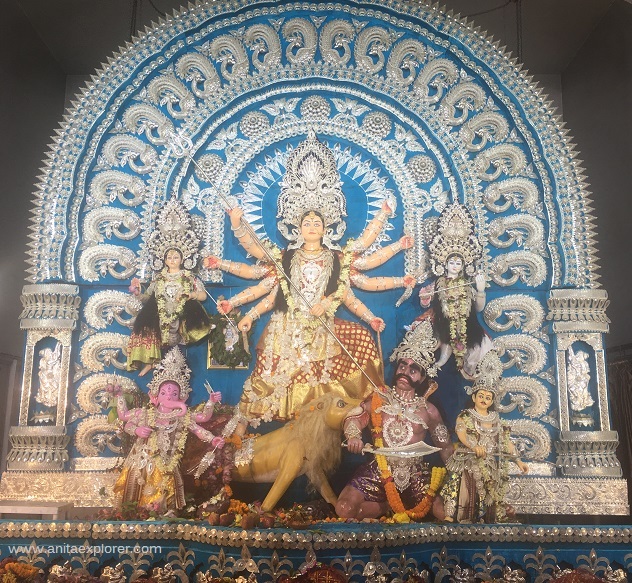 Beautiful murti of Durga Ma. Lovely. 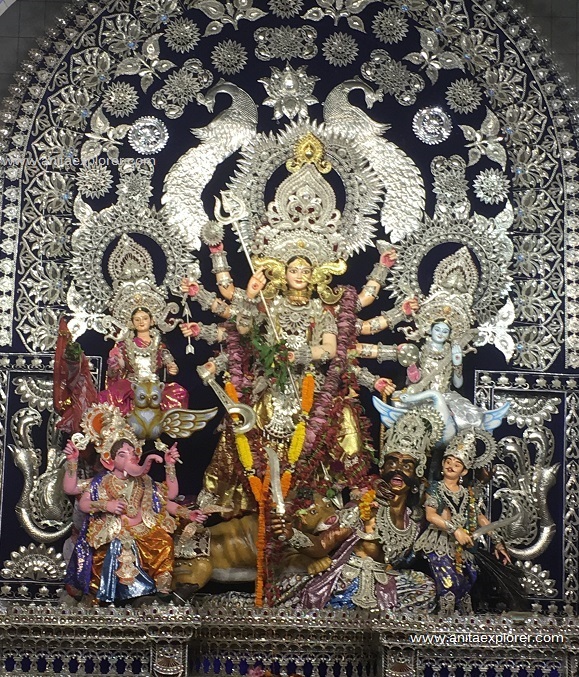 Jai Durga Di. I meant to say Jai Mata Di.